The U.S. military came under criticism for U.S.-led military strikes in the Iraqi capital that hit the hotel housing hundreds of journalists and an Arab television network, killing three journalists and injuring three others. Two Arabic-language television networks — Al-Jazeera and Abu Dhabi — said their offices were intentionally targeted by American-led forces — claims military officials denied on Tuesday. "This coalition does not target journalists," Brig. Gen. Vincent Brooks said in Qatar. Early Wednesday, Abu Dhabi satellite television announced that it had been unable to broadcast live video from Baghdad overnight because American tanks were posted outside its offices, which are alongside those of Al-Jazeera. Al-Jazeera also did not broadcast live scenes of Baghdad overnight. Earlier, the Abu Dhabi channel appealed to the International Committees of the Red Cross for help in evacuating its offices. An American tank on Tuesday fired on the Palestine Hotel, where foreign journalists have been covering the war from balconies and the roof. Less than half a mile away, a reporter for Al-Jazeera television was killed when U.S.-led forces bombed his office. Nearby, coalition artillery battered Abu Dhabi's Baghdad office, trapping more than 25 reporters who phoned for help from the basement. "I'm astonished and shocked," Nart Bouran, news director of Abu Dhabi, speaking from the network's headquarters in the United Arab Emirates, said Tuesday. "We've been in this office for more than 2½ years. Anyone going into military operations would have known our location." Al-Jazeera chief editor Ibrahim Hilal said the U.S. military has long known the map coordinates and street number of his network's office. Witnesses "saw the plane fly over twice before dropping the bombs. Our office is in a residential area, and even the Pentagon knows its location," Hilal said in Qatar. Military officials offered different explanations for the attacks. Brooks initially said the hotel was targeted after soldiers were fired on from the lobby. Later, he told reporters, "I may have misspoken." U.S. Army Col. David Perkins, commander of the 3rd Infantry Division's 2nd Brigade, which deployed the tank, said Iraqis in front of the hotel fired rocket-propelled grenades across the Tigris River. Soldiers fired back with a tank round aimed at the Palestine Hotel after seeing enemy "binoculars," Perkins said. More than 50 news cameras were set up on hotel balconies when the tank fired, according to Associated Press photographer Jerome Delay. "How can they spot someone with binoculars and not (see) cameras?" he asked. Journalists said they heard no gunfire coming from the hotel or its immediate environs. 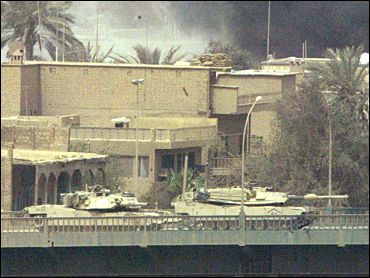 They had been watching two U.S. tanks shooting across the al-Jumhuriya bridge when one of the tanks rotated its turret toward the hotel and fired. The round pierced the 14th and 15th floors of the 17-story hotel, spraying glass and shrapnel across a corner suite serving as Reuters' Baghdad bureau. Killed were Taras Protsyuk of Ukraine, a television cameraman for the Reuters news agency, and Jose Couso, a cameraman for Spain's Telecinco television. Spain asked its journalists to leave Baghdad following Couso's death. Tareq Ayyoub of Jordan died at al-Jazeera's office, located in a residential neighborhood fronting the Tigris. In all, 10 journalists have been killed in combat situations since war began March 20. Ayyoub's widow, Dima Tahboub, speaking with Al-Jazeera by telephone from Amman, appealed to God "to accept him as a martyr." The wounded, all Reuters employees, were identified by the company as TV technician Paul Pasquale of Britain, Gulf Bureau Chief Samia Nakhoul of Lebanon and photographer Faleh Kheiber of Iraq. Pasquale underwent surgery Tuesday at a Baghdad hospital for serious leg injuries, according to colleagues. Nakhoul suffered shrapnel wounds and may require surgery. "Clearly the war, and all its confusion, has come to the heart of Baghdad," said Reuters Editor in Chief Geert Linnebank. "But the incident nonetheless raises questions about the judgment of the advancing U.S. troops who have known all along that this hotel is the main base for almost all foreign journalists in Baghdad." In a letter to Secretary of Defense Donald H. Rumsfeld, the New York-based Committee to Protect Journalists said it believed the attacks violated the Geneva Conventions concerning likely harm to civilians. In Belgium, the International Federation of Journalists said it appeared Tuesday's attacks may have deliberately targeted journalists. "If so, they are grave and serious violations of international law," said Secretary-General Aidan White. He also said Iraq, accused of using civilians as human shields during U.S.-led bombing attacks, may also be guilty of war crimes. Human rights groups have also suggested U.S. attacks on Iraqi state television violated the rules of war. But Central Command says the station was a legitimate target because it was allegedly broadcasting instructions to troops.